Before anything else, I’d like to tell you about how my weekend went. It’s funny how all the plans I had blew up. I did enjoy my Sunday because I spent time with Aira. We drank 2 small bottles of Smirnoff each and it was fun! We talked about work and all that adult crap but I really enjoyed it even if it was just for a couple of hours. I think that was one of the 2 highlights I had. The last one was I got to spend time with my mom and my sister while Kyx went out with his friends. It was nice to have some time away together. I feel like it’s really healthy! Okayyyy now, off to my emotions. Lol. So I was down for a couple of days feeling pathetic, feeling bad about myself. I was looking at myself in the mirror and I felt bad to see how much I have changed physically. I gained a lot of weight compared to how I was, I felt ugly and ashamed and I don’t even know why I sound so pathetic right now but honestly, that’s how I really felt. I ended up looking at people’s photos on instagram wondering how everyone looks so lovely while I look like a sack of potatoes. *sad face* lol. It went on for days and I am not in a good mood all the time, I wasn’t talking to people, I am always thinking like A LOT. It’s so hard to just calm (the fck) down when you feel bad and sorry about yourself. So I just let it roll, I was so mad about everything. I do not show it but I am raging inside. I feel like if my blood could turn into a different color when I feel this way, my blood would be so black. It was a bad place to be, seriously. I am not even proud of it. I have like 4 different people whom I talk so openly about stuff. My feelings, and confused emotions, everything about me—these 4 people know. So when I talked to them, I told them how I was feeling and that I am being insecure, pathetic and crazy. I realized how I was able to admit it to myself. I was able to actually admit these flaws and I kinda felt relieved! So what am I getting at exactly? Well, when you know something is wrong, when you feel different from usual, dig deep into where it’s actually rooting from. Look for it and no matter how hard to see it, stare it down. Look at it intently, hold it then embrace it. Embrace each and every flaw because the moment you have learned to admit it to yourself, the better you will feel. The moment you have accepted that you have these certain flaw, you will be able to work around it and overcome it! 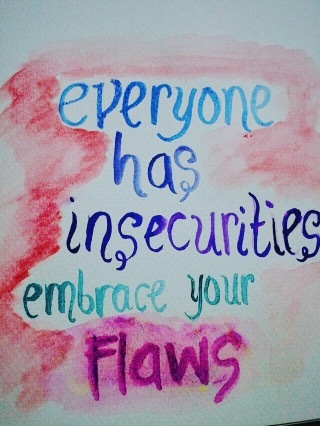 I realized that everyone has insecurities. Even the prettiest, smartest, handsomest, wittiest, most artistic people have their own insecurities. So instead of trying to struggle and battle with your flaws, embrace it, and you’ll overcome it in no time. Every gesture, may it be sweet but small, genuine yet silent can speak volumes. The intensity it gives, the impact of how a simple gesture can mean so much. The sincerity of every action needs no words, no explanation. Nothing at all. It speaks so loud, very loud. Thumping in my heart, drumming my chest, makes my lips tremble. That’s how a simplicity of a genuine action can affect the emotions and spirit of a person. Not every meaningful emotion can be said by the lips, not everything shall be heard by the ears because if you listen to what your heart could hear, it’s thumping and jumping for joy, crying tears of happiness, because the amount of how amazing true feelings are– speaks so loud. Very loud. When the thrill was over, the rush has subsided, my pulse is slowly steadying, my heartbeat slowing down. That’s when I know I am in the aftermath. The butterflies are still there, I tried to blink for a dozen of times just to make sure I am not dreaming. The aftermath of the love bug came through and now I feel overwhelmed. Not tired, not restless, but my face is aching. All the smiling hurts and I keep gritting my teeth. This is the pang of joy I am in. The bliss. The nirvana. Everything in one roll! The reminder that everything hurts is always there. You hurt your face when you smile too much, you hurt your feet, legs and toes for standing up and running way too long. But your heart is happy, you can practically hear it sing with joyous melody. The aftermath of that tremendous love date. The aftermath isn’t always bad and disastrous. It hurts but it’s a lovely feeling. I would love to be here for like the whole day today but I feel like I wouldn’t be able to do so cause he internet is acting funny and Kyx will use the desktop for DOTA 2 and my laptop with be a useless piece for a while since the wifi wouldn’t be much of a use too! Now, I plan to read and have tea but you can always catch me on twitter and instagram if you feel like it. Just so if you want to get a hold of my microblogging on twitter heeheee ahhaha. Thank you and I hope ya’ll are having a nice weekend. P.S. all of my weekend plans went to the drain and I am not sure if I feel bad about it or I’m okay? Nonetheless, I shall believe everything happens for a better reason than I have thought of. 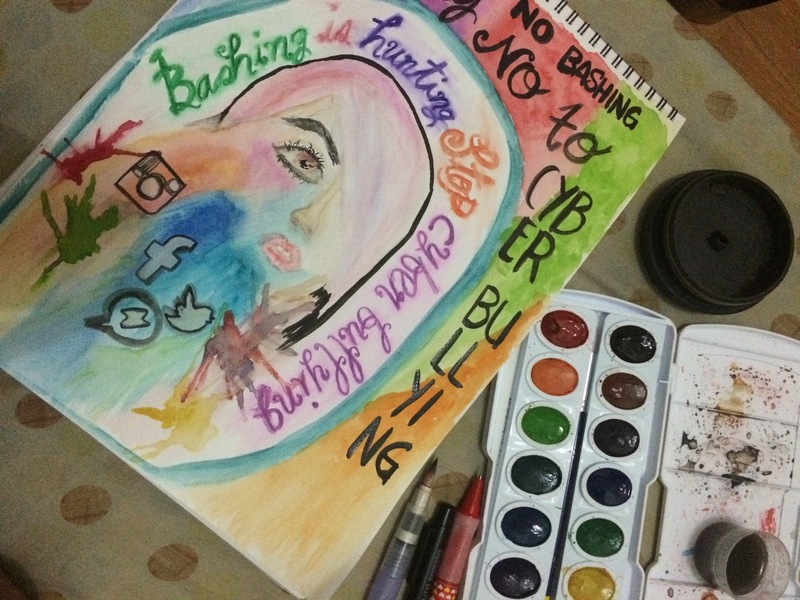 Bullying in all forms, cyber bullying, bullying at school, all of these, are not healthy and hurtful! Usually, people think that the geeks, nerds, silent kids, “dead” kids are the only ones who are bullied. Nope. That’s not the case. In movies, there are taunting and a LOT of other bullying methods children do! They call you names, laugh at you, tease you, talk behind your back, spread rumors, give you trouble, turn everyone against you. Some even do it secretly while others do it for their own “great glory”. In the Philippines, I was lucky enough to not be bullied. I have very little exposure to mean kids partly because I feel like everyone is really friendly. I didn’t feel isolated, I am happy with the group of friends I have, I joined a lot of extracurricular activities and I am one of my batch’s active students, so it’s either I really have a lot of friends or there aren’t any bullies to begin with. For my sister, it’s a different story. You see, my sister is a pretty young lady. She is popular at her school for being one of the most beautiful (I hope I don’t sound like I am exaggerating this but this is a fact). Boys would have a crush on my sister and I think other girls get jealous because of this. My sister is an active athlete (before). She is a member of the school’s varsity team of track and field and boy is she a good runner. She also did well in her class. She wasn’t the shy type of person but she isn’t loud as well (well that’s what I think but idk for sure about now since she’s already in 9th grade). You would think she has everything and no person would start a fight or bully her, it’s not the case. She was bullied for all the reasons I just stated above. She was bullied for being a nice person, for doing great in class and in extracurricular activities. She was bullied and taunted several times via social media, via sms. She was bullied for being an “It Girl” for God’s sake. I didn’t find out immediately cause she never told me, she didn’t act differently and she continued going to class like nothing is happening. One day, I was trying to fix my old blackberry phone when she suddenly asked me to look at the messages on her phone, there were tons of text messages from numbers unregistered on her phone. A lot of cursing and name calling. Blood went on top of my head and I feel like exploding. WHO THE HELL CALLS MY SISTER THAT!!! I was sooo damn furious. I went ahead and replied and asked why that person is texting my sister. I am so angry that I took a screenshot of everything, printed it and I went to her school and talked to her adviser. I was on the verge of tears. I was so mad. How dare these kids call my sister names and even taunt her and threat her to not go in the cafeteria for lunch because according to the bullies my sister will “see what she’s looking for”. I just felt so bad for my sister. She’s not one to start fights and she wouldn’t even bring herself to it. The bullying sorta stopped and the class adviser spoke to the girls who bullied my sister. What I was so proud about is how my sister faced the bullying. She might have gotten hurt through words but she stood so brave and courageous. She didn’t let it affect her. She just lived her life away and didn’t mind what other people say about her. That’s really good. Though my heart breaks for people who are bullied way too much, who are not strong willed or who can’t stand the abuse. Nobody deserves to be treated this way. If you know people who are being bullied, be brave and stand up for them. Show them that they shouldn’t let themselves be treated that way. Show them someone is at their side. Be there for them when no one, not even their own selves is there for them. This looks really highschool-ish but it’s meant for my high school sister who has a homework and needed help. I plan on writing about cyber bullying soon! 🙂 btw, my sister is a victim but I’m glad she’s strong and never let people bring her down! Okay, before anything else, I would like to explain that I didn’t really try to harm myself. I mean, I didn’t want to kill myself. I still don’t know what happened, I still didn’t feel suicidal up to this day but I feel confident to share this to you. When I was in high school, I feel like I was living an amazing high school life. I seem to be on top of everything and it felt really nice! I was doing good things for people, I was a nice person, I was very friendly and helpful. I did everything with grace, I am a top student, I have amazing friends, I am not in any high school drama of sorts and I loved life! I did everything and got to know for my “wonderful” job. But I feel like that’s just a surface. I was a silent person at home, no one ever knew what’s going on in my mind. I would usually have fights with my brothers and got hurt because I feel like they do not understand me. I feel lost, I feel heart broken, I miss my mom (my mom used to work overseas just to give us a comfortable life) I didn’t know what to do and I didn’t feel like talking this out with people I love so I kept it to myself and I resorted to cutting myself as well. I would get a cutter, I would even sterilize it just so I wouldn’t die (how ironic) then I cut my skin. I would just tear it a little. Just over an inch horizontally. It would turn really pink, then I could feel a small pain then I will continue to run the cutter over the pink skin until it bleeds. It will only bleed a little and then I would be so relieved afterwards. It made me feel really nice after the wound so I sorta got addicted to it. Whenever I feel in pain, whenever I feel sick, whenever I am stressed out, I would get my cutter and do it over and over again. I would wear tons of bracelets, bands, friendship bracelets just to hide the wounds and scars. I never told anyone about the gravity of what I was doing. I never told people close to me what I felt after cutting. I told some of my friends in high school but they feel like I was just being dramatic and I wouldn’t blame them for that. So it went on for years until I think I was in my 3rd year in college. I told my best friend about it and she got so worried. She didn’t judge me and what I loved was she tried to understand the pain I was going through. She told me that I should try to stop this cause it’s being a routine already. It wasn’t easy to stop. I would always relapse and cut my skin again and again. I would stop for a while but then I would get back at it again. It was emotionally painful to be in that sort of position. I didn’t do it and I wasn’t doing it for attention and pity, I just felt like it was my outlet. One day, I just threw all my cutters and anything that would be able to cut into my skin. I stopped and really tried hard to not relapse. For years and years, I wore a lot of bracelets on my left arm just to hide the scars. I wasn’t comfortable seeing it cause I might get back to doing it again. I tell you it wasn’t easy. Then just before I turned 25 this year, I took off every bracelet and stared at my scars. It didn’t feel so bad. I am proud now that I can look at it, touch it and not feel bad about myself. I don’t feel the need to cut my skin too! Now that I got this off my chest, I can say it took soooo long for me to be able to admit it to myself and to everyone else but I am glad I did. If you are feeling down and in so much pain, do not inflict more pain. Just embrace it until it hurts no more.